I’m trying something new — music in the background while I write, a soundtrack to inspire. So I pick Simon & Garfunkel. And I instantly discover the problem with this sytem: I stop and sing. I mean, can you blame me? Here is their genius: they make me feel what they feel, with intensity. I mean, I promise I have never “taken comfort from the whores on 7th avenue” — my comfort vice is ice cream — yet when they do declare, I do declare along with them. How do they DO that? How do they get me in that moment with them when I have nothing in common with that experience? It’s not that the details don’t matter. They matter a lot. They paint the picture. What doesn’t matter is if I have or haven’t experienced those details myself. What I’m sharing with them is not the experience of say, taking a bus across America, but the universal feeling of wishing and yearning. That’s what I sing along with. That’s what I need to write like. I hum their tune and some Boxer part of me wants to break out of my mold, wants to write and punch my way to glory. Another line plays and I think, aha, I can relate to that one. “All my words come back to me in shades of mediocrity…like emptiness in harmony…” Those clever devils even got a good line out of writer’s block. Next to me is today’s newspaper, with stories that crush the heart. Earthquake in Taiwan. Libya is the new Syria. Syria is still Syria. It’s easy to ask, what kind of a world do we live in? And this morning I’m happy to be reminded that we live in a world of beauty, too. Enjoy. This is totally how we sweep around my house. Of course not. 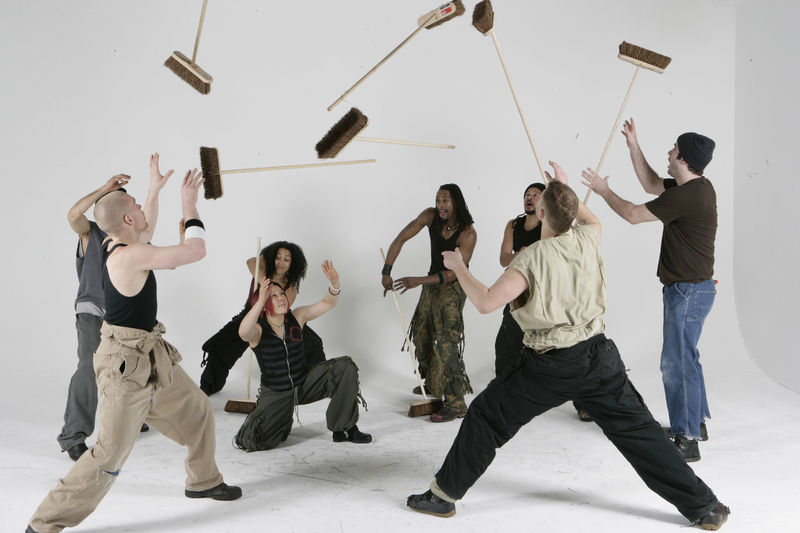 This is STOMP, which I saw for the first time when I wasn’t all that much older than my kids are now. It blew my mind when I saw it. Nothing had ever been so downright funky-to-the-beat, imagination-en-fuego as this. It is deservedly an international juggernaut of a show, with permanent companies running in London and New York. It has been in L.A. before and I’ve missed it. Not this time — I’m taking my boys this Wednesday (yes, a school night, yes, a test the next day), and I cannot wait to watch their minds blown. Especially my budding drummer. There is a chance that I will be the most excited of all of us, that I will embarrass them by shrieking like the Beatles are on stage. All I can say is, that’s a chance I’m willing to take. Look out kitchen drawers, look out mops and buckets, look out whatever we will get our hands on. It’s gonna be epic. Hanukah Games — Yiddish Password Rules! And on the 6th night of Hanukah, the Jews played Yiddish Password. When I was a little girl, my grandmother tried to teach me Yiddish. Do not be fooled. Although she was a first generation American born in Bensonhurst, Brooklyn to eastern European Jewish immigrants (known to me as “Big Grandma” and “her husband”), she was a thoroughly modern Lilli. Our first lesson took place in the leather seats of her Porsche 911. “Vus es dus?” she intoned, pointing. “Dus es a stickshift.” That’s as far as the formal training got. I suspected her qualifications at that point. Our Hanukah parties have a flair all their own. We used to spend hours playing football or softball on the field just outside their home. But calmer heads prevailed, and now a certain gang spends hours around Liz and Mitch’s poker table, betting and bluffing like schizophrenic Martians. Pair of 2s? All in! Mitch has become the entertainment maven for these events. For many years he printed out lyrics for Adam Sandler’s The Hanukah Song, until the children protested that it was embarrassing to hear their parents singing “and smoke your marijuanica!” After a couple years more, we heeded their complaint and switched to singing the Maccabeats’ Hanukah versions of pop songs like Taio Cruz’s “Dynamite” (“I throw my latkes in the air sometimes”) and Fun’s “Some Nights” (“StandFour”). One exceptional year we got to crawl through an elaborate maze built by Mitch and their son Nathan. What had begun as a haunted Halloween maze crafted from cardboard boxes and duct tape in the garage, became the “in search of the first temple” maze for Hanukah, complete with a narrative about Alexander the Great conquering Jerusalem, a battle scene (using skeletons from Halloween), and a Temple Wall the kids could draw on. It was epic, until my niece got left inside and Great uncle Larry had to crawl in to rescue her. Mitch reports that he would have kept the maze but the boxes attracted termites, so that First Temple was also lost forever. Which brings us to Yiddish Password, this year’s invention, which required far less physical labor than the maze. You may recall the old game show: in teams of two, one person sees a word that their teammate has to guess, and gives their teammate clues to help them guess. The shtick? All the words were Yiddish. Mitch has generously put his game on YouTube, so do yourself a favor and try it. You will be surprised at how many Yiddish words you know, and how many words you never realized were Yiddish (“stick shift” was not among them). Schlemiel. Putz. Schlock. Schmuck. We’ve got all the best put downs. It’s a great language teacher, better even than Grandma Lilli could have concocted, but best of all is the laughter you’ll generate. Watching my father act out “schlemiel” was one of the funniest things I’ve seen. Meshugenah mishepuchim. Happy playing, and happy Hanukah.